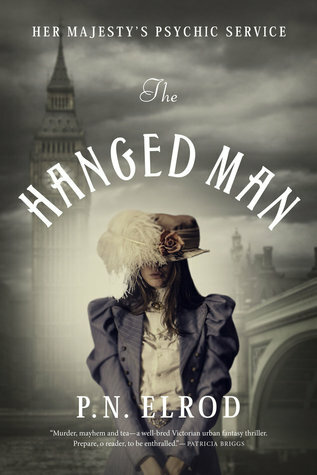 One of my favourite authors, Gail Carriger, gave The Hanged Man such a glowing review that I just had to give it a shot. Although it sat on my Kobo for a while before I got around to it, that’s probably for the best because now I can’t wait for the next book to come out! Synopsis: As a member of Her Majesty’s Psychic Service, Alex is called out in the middle of the night to ‘read’ a crime scene using her paranormal gift, but is unprepared for the resulting chaos when the identity of the deceased is revealed. As events begin to spiral out of control, Alex is forced to turn to her estranged family for assistance, but isn’t sure how much help they will provide when it seems like they would rather forget her very existence. Maybe I’m just an old stick-in-the-mud, but I really do like that the romance aspect was very minimal and didn’t take anything away from the meat of the story. So many of these steampunk books end up being more steam and less punk, if you catch my drift. Although there is a bit of a love interest happening, Alex is an independent woman who works for a living and isn’t ready to settle down just because some handsome young man comes along. I was thrilled to read a murder mystery/paranormal fantasy book that focused on a protagonist who was dashing off into danger, who also just happened to be a woman who rarely commented on the fact that corsets are constricting, skirts are a hindrance, etc. Of course it was mentioned, but it wasn’t brought up nearly as often as in some books. I felt so bad for Alex because she didn’t seem to have a very good relationship with anyone. The consequence of her power, which is being able to read the emotions of others, meant that she had to distance herself from just about everyone to avoid being overwhelmed. Being able to tell when someone is lying, or just doesn’t feel the same way about you as you do about them, must be exhausting. Her life was probably very lonely when everyone was afraid that she would be able to read the truth of what they were saying. Her family was pretty awful, although there were a few who ended up redeeming themselves in the end. All in all, I really hope the author decides to write another book in the series. I have so many unanswered questions, and there is definitely room to continue this story. I’m not entirely sure if I want the following book to continue with Alex as the main character, or if I want to read about someone else in the story. There are definitely some interesting characters in this series that need to have their stories told.